No more forgetting keys, no more propped open doors, and no more lock replacements. 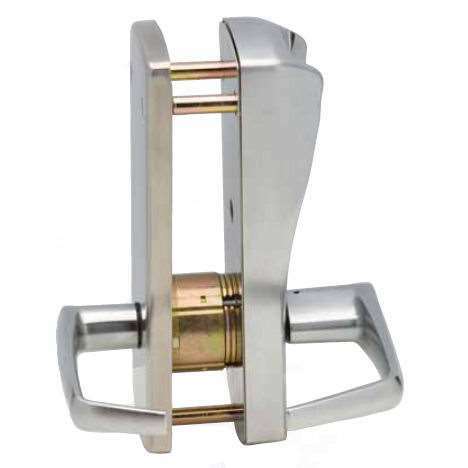 Just fit this new Heavy-duty electronic mortise lock on your door in place of your current mortise lock, and start cutting virtual pass-keys, instead of metal ones. Able to support up to 100 codes, every one on your staff can have their own, and when someone moves on, instead of re-keying, simply delete their code in seconds. Transforming your access to keyless entry with the E-Plex 2000 mortise yields efficiencies, economic savings, and creates a stronger sense of security because this lock only knows to keep itself locked, unless someone with a valid code requests entrance, or an authorized individual sets the lock to code-free entry. 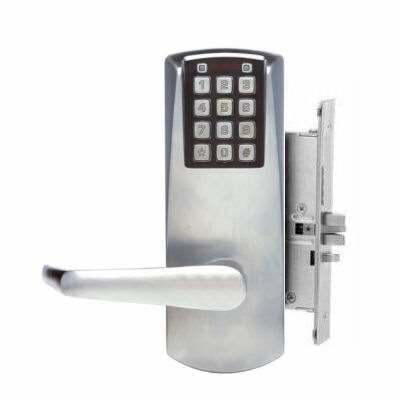 For these and many other reasons, the Kaba E-Plex 2066 mortise lock works wonders as a first-class keyless entry system on virtually any wood or metal door machined for a mortise (86) cut-out. All for a price anyone in this industry will tell you is unheard-of for electronic mortise solutions. Product Enhancement | Effective 3/1/12 E-Plex 2000 Series locks now available with audit trail and software management. Utilizing the M-Unit Kit (sold separate), and E-Plex Standard Software (Download FREE), you can access the last 1,000 audit events recorded in memory, including the use of the mechanical key override. 8 15/16 (H) x 3 5/16 (W) x 2 3/16 (D) in. 8 7/8 (H) x 3 1/4 (W) x 2 1/4 (D) in. Both of the locks that I ordered worked out very well. The ‘quick’ instruction sheet is absolutely useless. You REALLY NEED TO HIGHLIGHT that you can’t program the lock until the master passcode is changed. We love our new Kaba locks. It took us awhile to get them installed and programed. However’ the parents of our children were all very excited to see them on the doors and we have had a lot of positive feedback.